This is a smaller version of the popular cherry necklace, it is the same size as one of the cherry drop earrings. This necklace makes a perfect gift and looks really cute and very wearable. Vibrant green enamel leaves combined with pretty pink garnet gemstone beads. 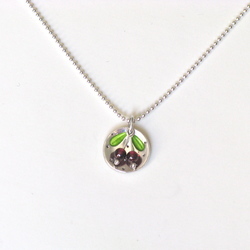 The pendant measures approx 1.5cm across and hangs from a pretty 18in silver beaded chain.